You’re issued with a new project – survey 1,200 sites in 6 countries as quickly as possible. Record equipment, review LAN points & cabinet space, and collect site photos – all in order to upgrade these sites to a new network and cloud-based telephony solution. That’s exactly what happened to Connection Telecom, a SOLIDitech Customer. It’s a big job. Field Service Management always is. Tackling the problem the ‘traditional way’ would require a vast logistical team to coordinate engineer on-site appointments and tons of folders, Excel sheets and photos to manually record the information. Not to mention the miles of to-and-fro email chains to collate and submit all of that information, generate reports and build an implementation plan. SOLIDitech’s answer was to incorporate the required survey information (and more) into the SOLID Mobile App. 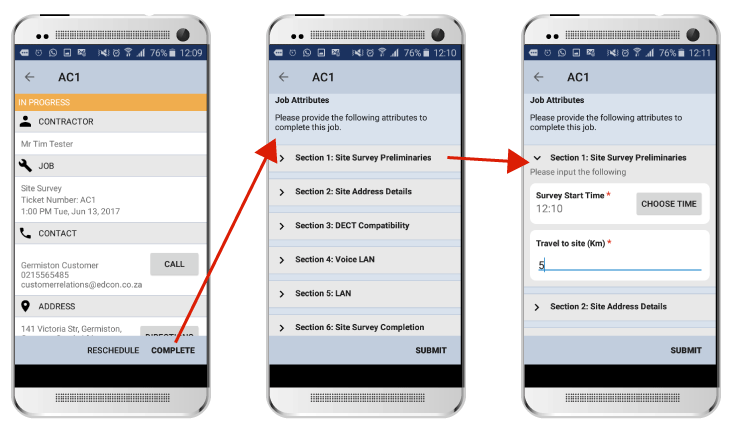 Using the SOLID Mobile App, Connection Telecom was able to complete the required surveys in just 105 days. Geographically dispersed engineers could very quickly and easily collect the information they needed without the hassle of paperwork – resulting in fewer mistakes, more accurate results and a more effective workforce. Central Control: The Logistics Coordinator schedules appointments centrally and SOLID automatically sends the appointment information directly to the relevant engineer’s Mobile App. It also emails a confirmation to the customer and includes a calendar appointment and SMS reminder. 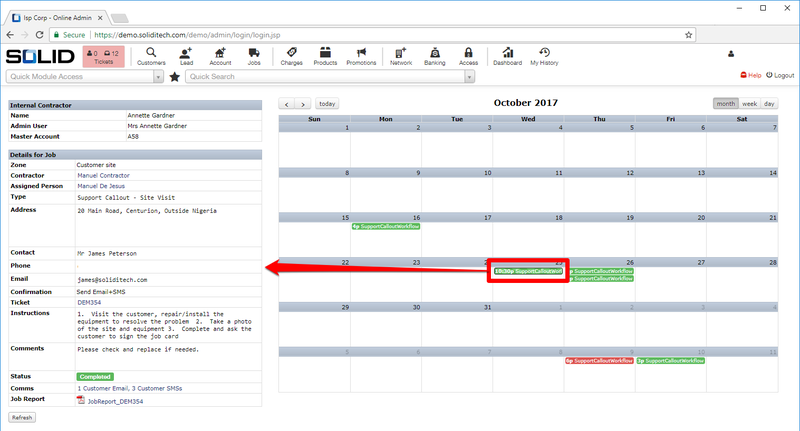 Easy Tracking: Coordinators can access a central calendar-style view of all past, in progress and future appointments, complete with ‘quick-view’ status information. Information Capture: The Engineer then uses their mobile device to confirm when they’re on site (automatic GPS capture). They answer pre-populated survey questions, capturing photos of the site and scanning the equipment barcodes when necessary, directly on their Mobile App. Job Completion Sign-Off: The Customer then physically signs off the job on the Engineer’s mobile device – signatures are captured digitally through the Mobile App. Reporting: Through the mobile device, the Engineer then presses the ‘complete’ button within the job and a PDF site survey report is generated within a few seconds. The report is stored centrally on SOLID and the project plan is automatically updated in real-time. Any necessary remedial actions are automatically created based on information captured. SOLIDitech’s Site Survey Mobile App enabled Connection Telecom to survey 1,200 sites in 6 countries in 105 days. The rapid and accurate results from a wide geographic area has enabled Connection Telecom to deliver the most beneficial services to their customers in record time. Vox’s lead management solution uses automatic location detection to enable customer self-service. Based on a pinned or entered location, the website uses real-time information to display a list of available ISP services. From there, prospects can “Order Now”, and be guided through the purchase process, or ask to “Keep Me Posted”, creating a real-time “Wishlist”. SOLIDitech was built on the skills and innovations of our software team. To this end, we have partnered with Code4CT, a Cape Town-based charity, to give the gift of code to 100 girls this festive season. Visit our website to find out more about this exciting campaign and how you can help them too! On 24 March and 2 March 2017, SOLIDitech hosted their Cape Town and Johannesburg Company Update Meetings respectively. The goal is to deliver key reporting and strategic company information and enjoy a great ‘chill’, giving everyone the opportunity to relax, chat and enjoy a fun evening.